Explanation: Nothing like it has ever been seen before. The unusual space rock 'Oumuamua is so intriguing mainly because it is the first asteroid ever detected from outside our Solar System -- although likely many more are to follow given modern computer-driven sky monitoring. Therefore humanity's telescopes -- of nearly every variety -- have put 'Oumuamua into their observing schedule to help better understand this unusual interstellar visitor. Pictured is an artist's illustration of what 'Oumuamua might look like up close. 'Oumuamua is also intriguing, however, because it has unexpected parallels to Rama, a famous fictional interstellar spaceship created by the late science fiction writer Arthur C. Clarke. 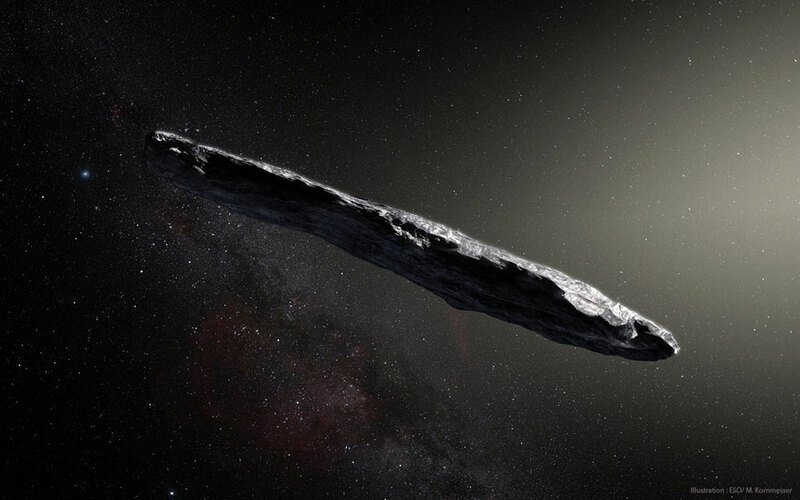 Like Rama, 'Oumuamua is unusually elongated, should be made of strong material to avoid breaking apart, is only passing through our Solar System, and passed unusually close to the Sun for something gravitationally unbound. Unlike a visiting spaceship, though, 'Oumuamua's trajectory, speed, color, and even probability of detection are consistent with it forming naturally around a normal star many millions of years ago, being expelled after gravitationally encountering a normal planet, and subsequently orbiting in our Galaxy alone. Even given 'Oumuamua's likely conventional origin, perhaps humanity can hold hope that one day we will have the technology to engineer 'Oumuamua -- or another Solar System interloper -- into an interstellar Rama of our own.